I’ve been researching the history of the influenza vaccine, particularly its effectiveness. I have to tell you, I’m surprised and disturbed. I also have to tell you that I’m not an anti-vaxxer. I believe in vaccination. It eradicated smallpox. It has almost eradicated polio. Vaccination is good. That’s how I went into this. 1. Deaths from influenza declined over the 20th century. That reduction occurred before widespread use of vaccination and has been attributed to improved living conditions after World War II. Influenza death rates dropped sharply around the end of World War II (1944–1945). Another thing you can see in this chart, besides the reduction in deaths after WWII is that there were lots of regular flu seasons that were worse than pandemics. 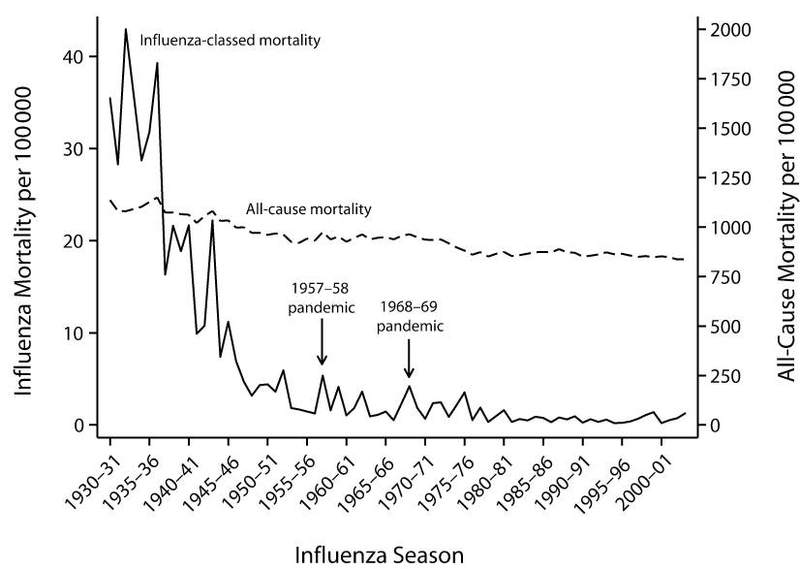 The inability of influenza vaccination to explain the clear downward trend in recorded influenza mortality during the 20th century suggests that these other factors* may play an important role in historical influenza epidemiology. 2. Lots of people (health professionals, researchers, you and I) have said, and continue to say, that it’s the flu when it isn’t, or when we don’t know. For most of the 20th century, influenza continued to be reported on death certificates despite the absence of laboratory confirmation of influenza virus infection. Between 1999 and 2001, there was positive confirmation of influenza virus for fewer than 10% of deaths recorded as caused by influenza. It is plausible that many cases and deaths from other (i.e., noninfluenza) ILIs (influenza-like illnesses) are being misclassified as influenza, particularly when they occur during the winter season. Viral circulation data on influenza as well as other viruses such as respiratory syncytial virus and rhinovirus may be helpful in an analysis of influenza’s impact on mortality, because these viruses often co-circulate with influenza. The CDC maintains such historical viral circulation data through programs such as the National Respiratory and Enteric Virus Surveillance System. Two attempts were made to obtain such data for analysis; however, the CDC responded that such data are only provided on condition of co-authorship, which I refused. 4. 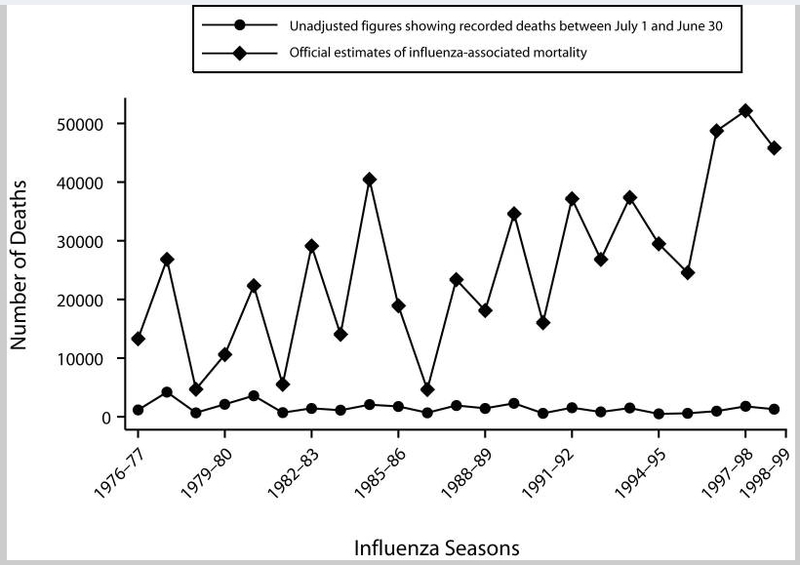 A pandemic, which we have been trained to think is a death knell, may not cause any more deaths than the regular seasonal flu (as we saw in that chart above). The considerable similarity in mortality seen in pandemic and non-pandemic influenza seasons challenges common beliefs about the severity of pandemic influenza. Many nonpandemic seasons were more deadly than subsequent pandemics. Pandemic years were difficult to distinguish from nonpandemic seasons. In the 1918–1919 pandemic, which stands out for its high mortality rate, although perhaps 10% to 15% of deaths were attributed to acute respiratory distress syndrome, many if not most of fatal cases are believed to have occurred because of secondary bacterial complications. Had no other aspect of modern medicine but antibiotics been available in 1918, there seems good reason to believe that the severity of this pandemic would have been far reduced. Historical influenza mortality data contain many relevant implications for influenza vaccination campaigns. The overall decline in influenza-attributed mortality over the 20th century cannot be the result of influenza vaccination, because vaccination did not become available until the 1940s and was not widely used until the late 1980s. This rapid decline, which commenced around the end of World War II, points to the possibility that social changes led to a change in the ecology of influenza viruses. Recent research suggests that vaccination is an unlikely explanation of mortality trends. A 2005 US National Institutes of Health study of over 30 influenza seasons “could not correlate increasing vaccination coverage after 1980 with declining mortality rates in any age group. 7. Yet, the CDC is upping the fear ante for some reason, along with that the high-octane campaign to get vaccinated. The top jagged line in the chart below are the deaths CDC said we would experience from flu. The bottom line is what we actually experienced – considerably less than projected. How can there be such a discrepancy between these lines? Year after year? Also note from the graphs in this post that vaccination took off in the early 1990s and by 2009 over 40% of adults had been vaccinated. But the line for deaths from influenza remains pretty steady. 8. Why the high death estimates? Commercial interests! It’s hard not to be cynical. I totally thought that the flu vaccine had been reducing deaths, a lot more than it is? I’m having a hard time reconciling this data with my preconceptions about the flu vaccine. This entry was posted in Uncategorized on December 1, 2018 by Bix. This is fascinating reading. Since my aforementioned reaction to the flu vaccine I’ve been more aware than before of how this particular vaccination is everywhere. Two weeks ago I went for my annual eye exam and of course (as always at this time of year) they ask if I’ve had my flu shot. Why is this important? Other doctors do the same (other than my primary care doc). It seems to me there are more relevant questions. An eye doc? Good point, about more relevant questions. It feels that the pressure to get the flu shot has increased over the years and is hard to even debate anymore. I get called an anti-science Luddite just for writing this, just for being curious. I feel bad for the author.